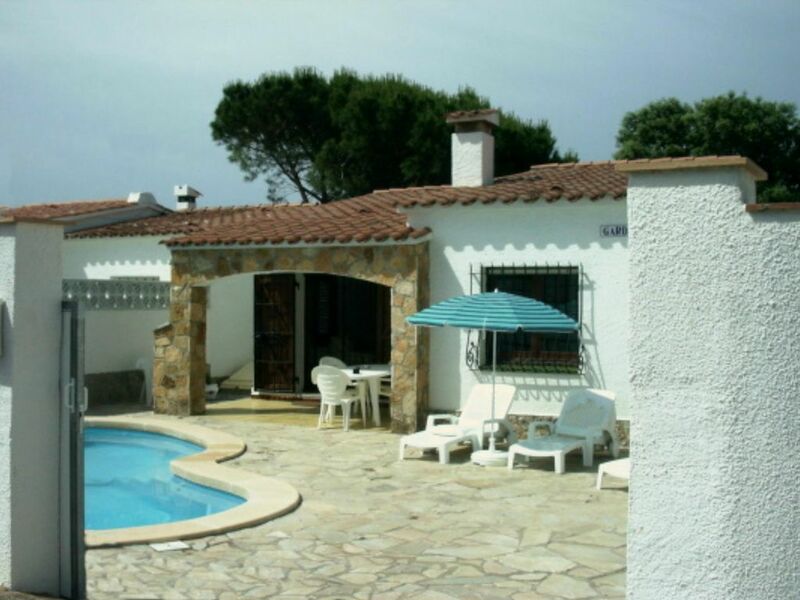 well maintained villa, south facing with full sun all day. Gardenia our 3 bedroom villa with private pool is set in secluded gardens, gated and secure for children with off road parking. Situated in the old fishing port of L'Escala in a quiet residential area, ideal for families or couples seeking relaxation. The south facing aspect of our villa allows for full sun all day with beautiful sunsets whilst relaxing on the terraces or in the swimming pool on summer days or evenings. Our villa has a comfortable lounge, diner with doors that lead to the front patio, pool and terrace. Satellite and all UK TV channels, HDMI DVD, sports, news, films etc with fast FREE Wi-fi all included in the price. A modern fully equipped kitchen, master bedroom a second double bedroom, a third bedroom with twin beds and a family bathroom compliments our villa. The pool has LED lighting where you can enjoy swimming under the stars at night, an outside solar shower, a large patio area with garden furniture, parasols, sun loungers and a BBQ terrace with a naya for dining al fresco. The old fishing port of L' Escala and the surrounding area is our idea of a perfect holiday! If you would like any more information on our villa or the local area please just ask when booking, we will be more than happy to assist. We love the Costa Brava for its many coves and sandy beaches, ease of access, the fantastic climate, scenery, mountain and coastal views make it like paradise on earth! The bathroom is fully tiled with heated towel rail, a bath, shower and toilet. The diner is equipped with dining table and chairs, together with traditional Catalan furniture. Doors lead to the front patio, pool and terrace. Sun loungers, parasols and usual outdoor garden furniture are provided for your relaxation. There is a naya [a covered porch] a BBQ with patio table and chairs for dining al-fresco in the evenings. There are seven major golf courses within a 40 minute drive. The superb 36 hole Emporda course is approx 10km, 20 minutes from our villa. The patio includes a solar heated shower and a private pool, 7m x 4m x 1.5m - 2m deep with Roman steps. The pool has LED lighting, where you can enjoy swimming under the stars at night. Change over days are flexible, depending on availability. Arrival from 1600 hrs and check out by 1000 hrs, this can be flexible subject to existing bookings taken. We have a helpful English couple living nearby who look after our villa, with their local knowledge of best places to go, to help you enjoy your holiday. The pool is maintained weekly and our villa is cleaned for your arrival, together with fresh bed linen and house towels. We enjoyed our stay at Villa Gardenia. It had pretty much everything we needed. One drawback for a party of 5/6 is that the WC is located in the only bathroom. This is down to the villa design and not something the owners can do anything about. Not a great fan of gas ovens but it was OK for what we needed. The villa is within walking distance of shops, bars and restaurants (about 20 mins at a good pace). We didn't use the pool much but it was nice to have the option in what was a particularly hot June week. Owners could invest in a large sangria jug, paella pan and sardine grill as these are things we would expect to find in a Spanish villa. Apart from that, couldn't fault it. Thank you for your review, and your time. There was a sangria jug and a paella pan at our villa earlier in the season when I was out doing maintenance work, annoying they were not there on your visit. I will get our housekeeper to replace them for future guests. This was a easy villa to stay in. It was spotlessly clean, the beds were very comfortable and the kitchen was well set up. The best thing for our family was the pool - the kids loved it and it was great to have it available whenever we wanted it. The pool was super clean and maintained. All in all - a very relaxing stay. Well recommended. Dali's house in Port Lligat was a real gem. Girona was well worth a visit. Aqua Brava (water park) in Roses was excellent. 30 euros pp is a lot but excellent value if you stay all day. Food in L'Escala was fine but we particularly enjoyed El Dynamic for tapas in Figueres and Rocambolesc Gelateria for ice cream in Girona. This part of Spain was beautiful. We would definitely go back. We had a wonderful relaxing holiday. the pool was adequate for our needs and the villa was full of all the things you would need for your holiday. Where the villa was situated it was quite so added to our relaxation. We did have problems finding our way back from the supermarket but this wasn't a problem thanks to google maps and by the second week had the route down to near perfect. The villa was clean and well maintained as was the grounds as well. We had a great time and would in the future book to go again. Thank you to the owners who were always on hand before the holiday and while we were there. Thank you for your lovely review. It was a pleasure to have you as our quest's and we look forward to welcoming you back for your next holiday. We had a lovely relaxing stay in L'Escala. The Villa itself was immaculate with everything there we needed. The pool was fabulous it was cleaned and well maintained. The local beaches were great our favourite beach was San Marti. L'Escala was just a short distance away by car and their was lots of nice resturants there. We would recommend this villa and look forward to visiting again. Going home with some wonderful memories. Thanks for your lovely review. We always beginning and end of season do vital maintenance and updates to our villa to make our guest's such as yourself, have an enjoyable holiday. Pretty property in quiet area, sechluded, private with small pool. The property is pretty, clean and in a quiet area, walled off so completely private. A walk of about 25 minutes to the nearest shops and half and hour to nearest beach. The pool is well tended, with someone coming in each day, however it is very small, only 7 strokes from end to end. The picture makes it look bigger. There is a caretaker you can call, who is extremely kind and helpful. The Sky tv hadn't been paid for, so we could only get a few free channels like the news. The house very much needs several things to be renewed. The fridge was iced up, with a massive block of ice at the back, it didn't work properly and has needed replacing for some time. Likewise the bedlinen which is rough and old, the mattresses, where you can feel the springs in one of them and the cooker, which only has one working shelf. The other one falls down with anything heavier than bread, but when we put bread on it to bake, it burnt the underside black after a few minutes. The gas barbeque is corroded where the flames come out, so the flames burn the food at the centre and don't cook it at the outer areas. I hate to say anything negative, the owners were very efficient and helpful when we booked, but didn't give any sense that they would replace the fridge, once we said it wasn't working, even when we said we didn't think it was safe and may not keep our food cold in the heat. A maintenance man came to mend the loo seat, which was broken when we arrived, a bolt was missing, so it swung to one side dangerously when sat on and he said the fridge was broken, the gas couldn't circulate and it should be replaced. He had to order the bolt, so it never got fixed in the 2 weeks we were there. I would recommend the property as long as these things were rectified first. I've given it 3 stars on the understanding that things got replaced that were past their best, or broken. After such glowing previous reviews, I was surprised to read your review as we heard nothing from you whilst at our villa. Regarding the bed, a previous guest had turned the mattress over and the memory foam was underneath. All the linen has been replaced. It is not possible to obtain Sky UK TV channels via a satellite dish in many parts of Spain now, including L' Escala. You can now view all your UK TV channels, news, sports, films via a fast internet connection to the new smart TV we have installed. We have since found out no engineer called regarding the fridge and that the fridge iced up because you set the fridge to the max setting, was you trying to use the fridge as a freezer? Our previous guest broke the toilet seat but that was fixed before you left. Not many guest bake cakes while on holiday in August but we will replace the oven and BBQ if necessary. The pool size for the patio area and garden we feel is correct with dimensions given on the website. Thank you for your feed back. Our villa is nearby to the famous ruins of Empuriés along the coast, two complete towns, one Greek, one Roman, where you can wander through ancient times. The beautiful beaches below the ruins are a perfect place to relax after a morning exploration. You could also walk along the board walk to the tiny medieval hamlet Sañt Marti for lunch in the square over looking the sea. Visit Figueres where the Dali Museum is located, Barcelona the capital of Catalonia, and Geroña the medieval walled city is a worthy day trip from our villa. As an antidote to cultural overload, why not visit the Aqua Brava water park on the outskirts of Roses. On our visits we have found it clean and a carefully landscaped theme park with plenty to do throughout the day for all age groups. Another suggestion, spend a day on the Dali Trail driving along breathtaking mountain roads, through the pretty town of Cadaques and on to the coast road around the artist former home at Port Lligat all within easy reach from our villa. There are many hidden coves and much more to enjoy, all of this information will be gladly shared with you. Change over days are flexible, depending on availability. Check in from 1600 hrs and check out by 1000 hrs, this again may be flexible subject to existing bookings taken. Included in the price, the pool is maintained weekly and our villa is cleaned for your arrival, together with fresh bed linen and house towels with no additional costs for Wi-fi.